Verti-Zontal shaft alignment, machine train alignment. 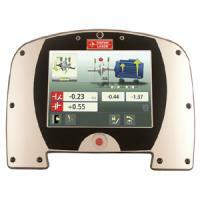 Best Fit: option to allow the system to calculate a reference line or plane, which illustrates the best fit. - control, without exiting the measurement screen, that the transmitter hasn't been removed during the actual measurement, which would cause incorrect measurement values.